Andrew Fuller was born in Wicken, Cambridgeshire, England on the 6th of February, 1754 and died on May 7th, 1815. Two hundred years after his death, the shadow of the great English Baptist pastor and missionary-theologian still casts wide, and I pray it will loom larger still in the days ahead. Andrew Fuller’s work, The Gospel Worthy of All Acceptation (1785) influenced William Carey and others and can be rightly considered the foundational document that launched the modern missionary movement. Fuller helped found the Baptist Missionary Society and was its leading advocate, fundraiser, and organizer. No historical author outside of the Bible has influenced my thinking as significantly as Andrew Fuller. What draws me to Fuller’s life and writings is that he addresses everything with the sober-minded clarity of a working pastor. His work as a theologian, apologist, and missionary never lost sight of Jesus, his church, and his gospel. No topic Fuller addresses is treated in an abstract and hypothetical way, but rather, he treats it as having concrete implications for week-by-week gospel preaching, congregational worship, pastoral care, and church governance. Fuller was gospel-centered and missional well before that verbiage become vogue in evangelicalism. He exhorted, “The army of the Lamb is composed of the whole body of Christians. Every disciple of Jesus should consider himself as a missionary” (Fuller, “Conformity to the death of Christ,” Complete Works, vol. 1, 315.). 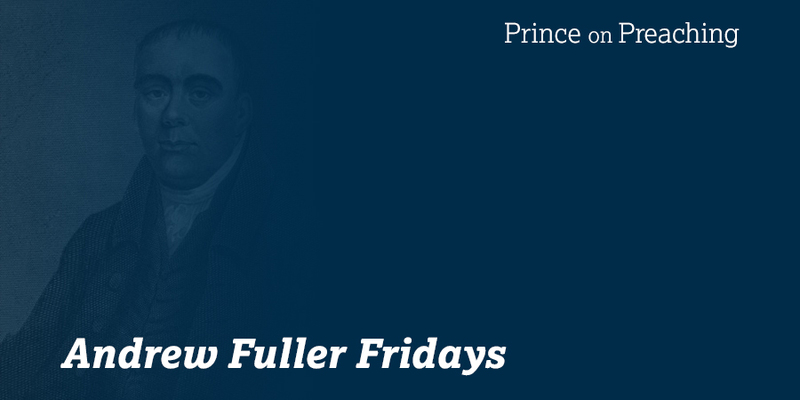 The commitment of Fuller’s life and ministry to the “the truth as it is in Jesus,” enabled him to challenge biblical-theological, ecclesial, and missiological errors from all directions. In 1780, he covenanted before the Lord, “thou hast given me a determination to take up no principle at second-hand; but to search for every thing at the pure fountain of thy word” (Fuller, “Memoir of Mr. Fuller, Complete Works, vol. 1, 20.). Fuller opposed the error of his day not as an end in itself, but it was always as a means to the end of honoring Jesus and summing up all things in him (Eph 1:10). Fuller vigorously rebutted man-centered Arminian theology on one hand, and the doctrinally serious, but evangelistically sterile, anti-missions High Calvinism of his day on the other. He defended the faith against Socinianism (which denied the full deity of Christ, penal substitutionary atonement, and moral inability of man to convert himself), Sandemanianism (which argued that saving faith reduces to mere intellectual assent to a fact or proposition), and Antinomianism (a belief that Christians are under no obligation to obey the laws of ethics and morality) as well. These theological errors have contemporary heirs among Modern theological liberals and no-Lordship salvation adherents. Throughout this essay I have italicized and underlined each time I quote Fuller using the phrase “the truth as it is in Jesus” in an attempt to highlight his use of the phrase and to reveal how foundational it is to his biblical-theological vision and ministry practice. Below I have added some heading and organized some examples of the way this phrase is a continual touchstone in the Fuller corpus.